This entry was contributed by Sierra Hutchinson, on September 22nd, 2016 at 9:00 am and is filed under Dialogue & Deliberation, Diversity. At a formative stage in my career, I was a secondary school Peace Corps teacher in northern Benin. My community lies along the Niger River. After class, teachers wearing cool, bright cotton poured three rounds of tea from a small, blue pot, while sitting on a braided plastic mat in the shade at the edge of the road. Motorcycle taxi-men napped on their “motos” in the shade of a billboard, feet propped up on the handbars, green and yellow uniform shirts buttoned once near the top. In the stiff air, goats pressed firmly against the whitewashed walls of the nearby mosque. During my English classes, I would ask my students complex questions in basic vocabulary: Who attends school in your home? What do you know about the scars on your cheeks? What do you grow in your fields? Why is it this way? We read from a handful of textbooks – 70 students under a corrugated roof. We held debates about ideas that emerged during these lessons and then created skits to illustrate what these ideas looked like in our own lives. Finally, we acted these skits in the open-air courtyard, to classmates and relatives under the neem canopy. Within our classroom, there were different types of learners – those who sat in the corners and observed, those who checked with their bench-mate for understanding, those who sat with confident elbows, Bic pens in three colors and a ruler, and those who spoke continuously and only to me. Gender, age, lineage and language group had a continuous and persistent presence among us. This is where I was introduced to Peace Corps’ trademark training materials, Participatory Analysis for Community Action. This is an approach to establishing “projects and programs shaped in a participatory process, with voices of the stakeholders themselves shaping the development process itself” (Peace Corps). Within a classroom framework, this looks like learner-centered teaching. As Phyllis Blumberg, Ph.D. writes, this approach shifts the role of the instructor from giver of information to facilitator of discovery. The shape of the interaction encourages participants to recognize their affiliations, exercise each role in comfort, and work from a place of trust. Standing among my middle school students, I allowed them to identify their natural affiliations. I asked them what they knew about themselves. I encouraged them to analyze and appraise those understandings through their own set of measurements. And then I waited for them to tell me what we might do next. The students, growing youth leaders in their desert community, gave voice to remarkable change. We took small steps forward together from there. This process works the same way in a community development framework. Engagement activities succeed when they encourage people to effect change on one another – making decisions on issues that have value, while developing the skills to carry out those decisions over time. This process begins in dialogue, by mapping the human capital, financial and material resources, inadequacies, opportunities, stakeholders, and beneficiaries to a situation. These discussions, not one but many, center on what is already known and valued, rather than on what is unclear and broken. Discussions occur in small and large groups, with liberal understandings of affinity: gender, language, ethnicity, age, profession, literacy, family size, learning style, and beyond. Like an inverted cone, the point – the heart of the matter – is easy to detect. Community members reach natural consensus by finding what lies at the root of the whole group’s collective values and priorities, while establishing commonality and trust through their interactions. The body of the cone, becoming wider and wider, represents the efforts and opportunities that stem from sharing what we have in common. In northeast Denver, remarkable for the presence of a vibrant community of refugees, this sharing of values has had profound impacts on the landscape over the course of ten years. Raised in rural spaces, the refugee neighbors’ desire for open land transformed a glass-strewn field into a community garden. This space put neighbors side-by-side, sharing garden tools, water and space. Amaranth grew next to cilantro and chrysanthemums. The gardeners’ desire for different seeds, more growing space, and more protected plots prompted the opening of a second community garden next door. The gardeners’ vigilance increased neighborhood safety and ensured an ownership of space. The community garden became a city park. The neighbors attended neighborhood watch meetings with city police, and voted on the restoration and realignment of an adjoining greenway. Student-centered learning, and sustainable development practices, aim to create stronger learners, who are in turn stronger citizens. Students, or community members, who can identify their own connection to an issue, are more invested in their experience, stay connected to it longer, and produce better outcomes overall. They are able to weigh the advantages and disadvantages of a decision from their own lens, and voice their support or dissent with confidence. This concept rings especially true for me as Decision 2016 quickly approaches. My civic engagement exercise this Fall links new citizens to experienced voting mentors. As the presidential candidates and their surrogates discuss the merits of our refugee community members, many feel that they have little voice in decisions made at a national level, although their wellbeing depends directly on such choices. Voting is a manifestation of leadership spirit, whatever the motivation. It is a process undertaken by those who feel a responsibility to one’s rights, to one’s neighbors, one’s predecessors, one’s successors, and by those who have been shown their ability to be heard. 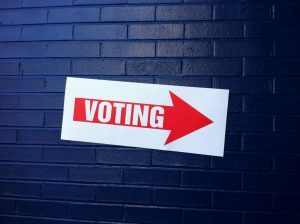 While we each register our opinions throughout numerous mundane daily actions, voting is an exercise that takes our level of responsibility from a direct impact – home, family – to a more indirectly public impact – neighborhood, state and beyond. For Denver’s refugee communities, as for any other imagined community, registering to vote and filling out a ballot is simply an exercise in literacy. Selecting a party, choosing a leader, or backing a policy decision is a greater exercise in leadership. Democracy comes from a deep place of connection, investment and voice. Community members participate actively in civic matters when these decisions impact their own lives. Just as teachers model for our students how to think, rather than what to think, so to must we as development agents lead community members to set the terms of measurement if we wish for them to believe that their vote counts. Sierra Hutchinson holds a Masters in International Development, Nonprofit Management and Capacity Building from the Korbel School of International Studies at the University of Denver. She has supported USAID-backed education projects throughout francophone Africa, specializing in non-formal literacy, establishing resource centers, teacher training, and curriculum development. Her current work supports community integration and leadership development among refugee communities in metro Denver.